Situated on an island in the Saint Lawrence River, Montreal is the largest city in Canada’s Province of Québec. It’s quite easy to navigate the pretty city, composed of distinctive neighborhoods in the city and by the waterfront. Montreal is a great city to visit for anyone interested in history, food and outdoor activities. It’s also the second-largest primarily French-speaking city in the world after Paris. So it’s a wonderful place to practice your French! Or, at least learn a few words en Francais, n’est-ce pas? From our home in Los Angeles, it was a pleasant five-hour flight on Air Canada to Montreal (Canadians spell it Montréal). We arrived on a Sunday afternoon and departed for Quebec City Wednesday morning. 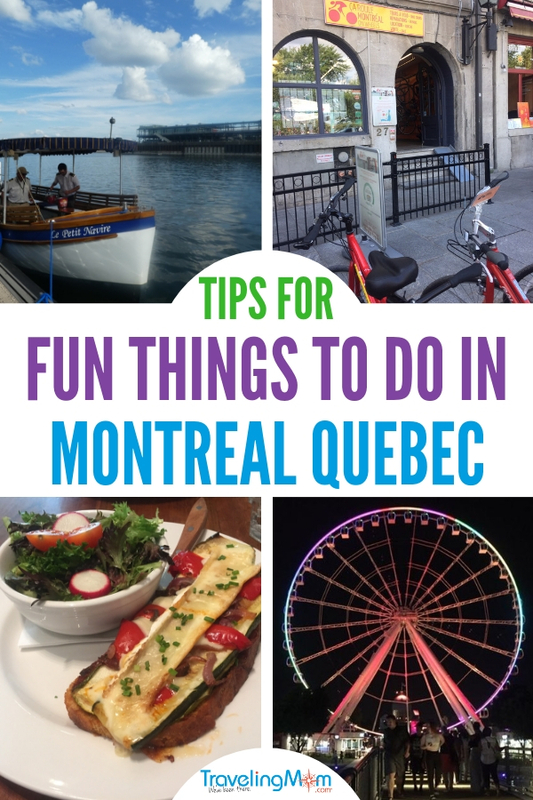 During that time, we found the best things to do in Montreal on walking and biking tours. We also explored on our own, and got around via taxi and metro. The Omni Mont-Royal Hotel was our home-base in Montreal. Upon arrival, while Christina relaxed in our comfortable room overlooking the swimming pool, I explored the hotel. Located in the heart of the Golden Square Mile, the Omni is walking distance to restaurants, shops and public transportation. 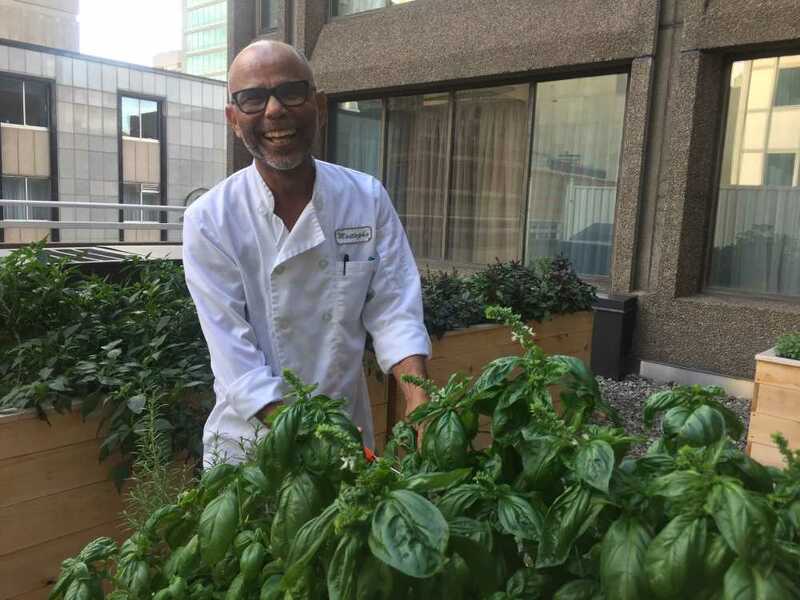 Out in the hallway, I met Mustapha, a friendly hotel chef who was on his way to gather some herbs from the outdoor garden. He invited me to accompany him to the pool-side herb garden, and said he hoped we would dine in Le Petit Opus Café during our stay. For dinner that evening, we walked a few blocks to the contemporary Blumenthal restaurant, located in downtown’s Quartiers des Spectacles. This modern area of Montreal is popular for its summer festivals. We sat in the outdoor patio at a corner table for two. Delicious food (salmon, steak/frite, a caprese salad) and excellent service made this a great dining spot. Although I’m not a big foodie, I do savor food walking tours. I find they’re a helpful way to learn about area history while sampling regional food. 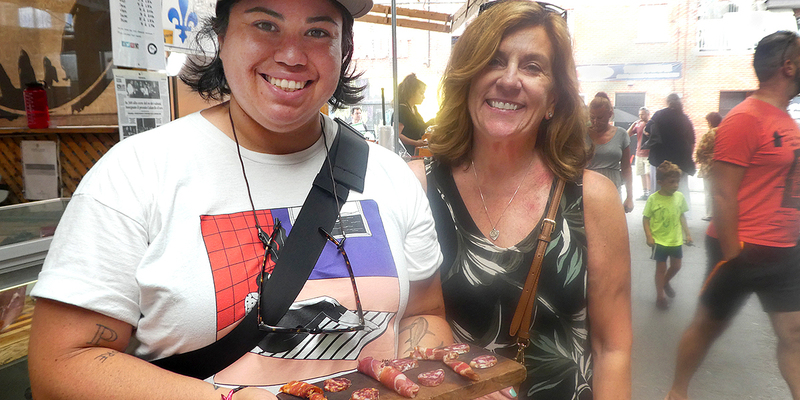 Friends recommended Spade & Palacio Food Tours to experience the Jean-Talon Market and local establishments like a local. Located in Montreal’s Little Italy district, the market is where locals and visitors shop for groceries and gifts. At the market entrance, we met our guide and tour co-founder Anne-Marie Pellerin, who brings visitors to her favorite eateries and watering holes. “We treat people like family and friends and show them hidden gems,” said Anne-Marie. Our Beyond the Market Tour began just outside the market at Le Marche des Saveurs du Quebec, a chic food market for Québécois products. There, we sipped ice cider and maple wine aged 10 years. Inside the Jean-Talon Market, Anne-Marie brought us to some of her favorite stalls for food samples. These included goat cheese from nearby farms, sausages, spices, and sorbet. At Les Jardins Sauvages, we sampled salicorne (sea asparagus) . “We use it instead of salt or with chips and beer,” said Anne-Marie. Our tour concluded with craft beer tasting at the brewpub Brasserie Harricana. From Little Italy, we rode the metro to Vieux-Port de Montréal (Old Port Montreal). I think this is my favorite area in Montreal. 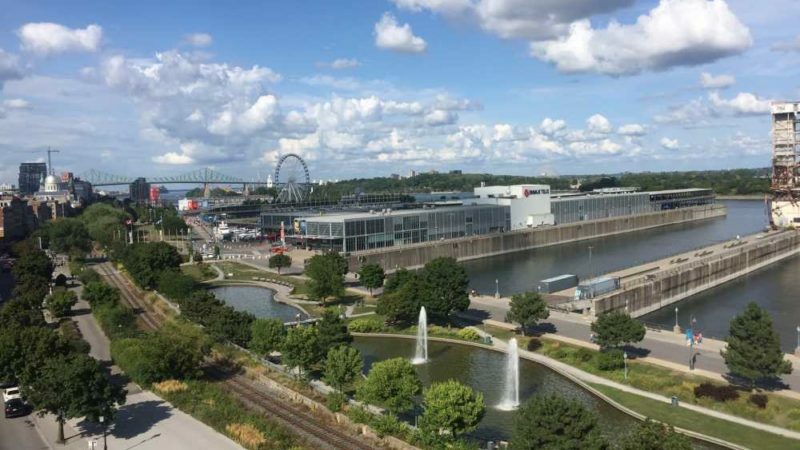 Dating to the 17th century, Old Port Montreal has a pretty waterfront anchoring several attractions. Across the street are cozy cobblestone streets with an assortment of cafes and boutiques. 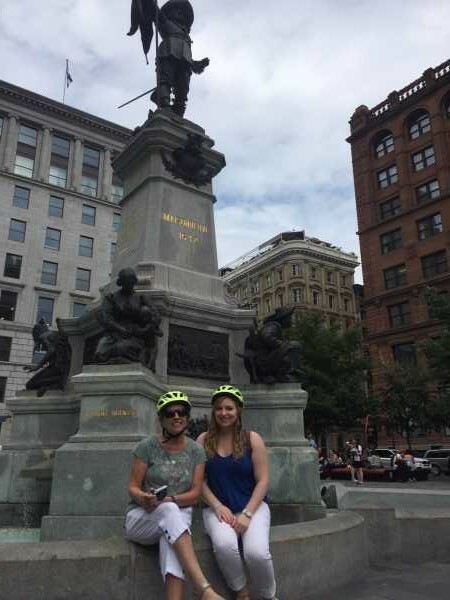 We spent two days exploring Old Montreal on foot and by boat and bike. Aboard Le Petit Navire, an electric-powered boat, we relaxed on a 45-minute tour of the port. The open-air vessel provided a nice breeze on this warm day, and picturesque views from the Saint Lawrence River. Our guide discussed Old Port history as we sailed past historic attractions like the Lachine Canal. The cruises depart hourly from the Jacque-Cartier Quay from May – October. Beer and wine are available for purchase. I love zip lines because each one is different. This one is Canada’s first urban zipline. Although just a single zipline, I enjoyed the aerial views as I soared over a portion of the river. The climb up the tower is 85 feet, and the zipline travels for 1,200 feet. There’s an option to rent ($5) a device that holds your phone so you can record your adventure. Located near the zipline is the Voiles en Voiles Amusement Park, a small pirate-themed play area for young kids. What better way to wind down a busy afternoon than with happy hour and a good meal? 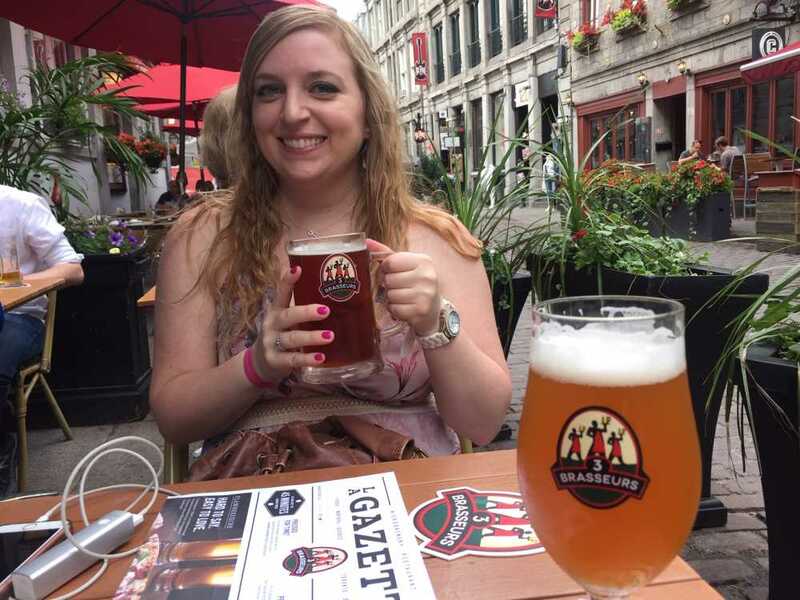 After checking out a few places we decided on Les 3 Brasseurs on historic Rue Saint-Paul, one of Old Montreal’s prettiest streets. Good choice! From our patio seats we took in the local scene and enjoyed tasty craft beer. Dinner was around the corner at BEVO Bar + Pizzeria. With its cozy ambiance and delicious wood-fired pizza, this was one of our favorite restaurants in Old Montreal. Advised to ride the Montreal Observation Wheel at night for panoramic river, downtown and mountain views, we saved this activity for last. During the observation wheel’s four rotations, we had plenty of time to enjoy the twinkling night views. Located in Old Montreal, Ca Roule Montréal (Montreal on Wheels) rents bikes and offers guided tours. Our bike tour through Montreal’s waterfront and neighborhoods was a trip highlight. Amélie Roland-Lamothe, our friendly and knowledgeable guide, asked what we had seen of Montreal so far so she could show us other sights. I loved her enthusiasm to share a local’s view of Montreal. And she definitely knows her history. 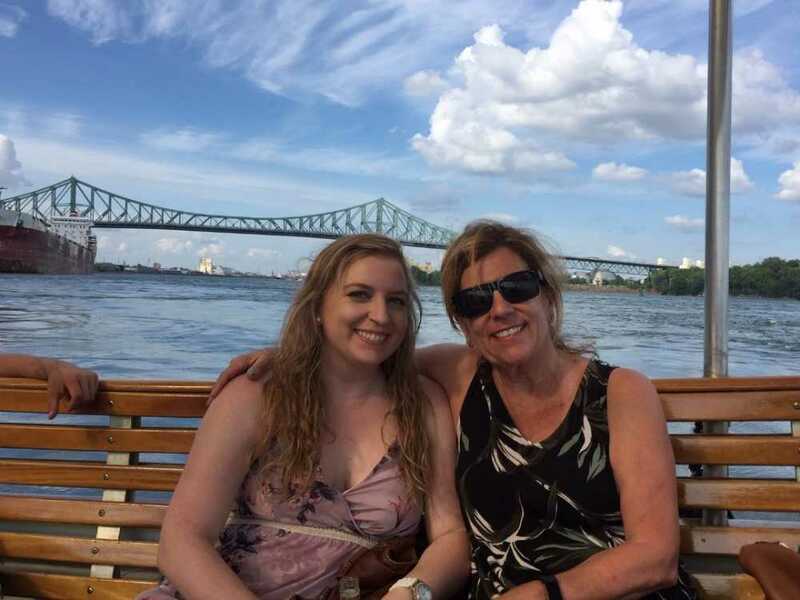 She customized a tour that started on the waterfront and weaved through distinctive Montreal neighborhoods and squares. These included residential neighborhoods, a gay village, and historic Place d’Armes. Along the way, we made several stops to chat and take photos. In the residential neighborhoods, she pointed out three-story townhouses that are typically divided into several apartments and accessed by exterior spiral staircases. We took another break in the Place d’Armes square. In the center there’s a monument in memory of Paul de Chomedey, who founded Montreal in 1642. While he got all the glory, a French nurse who was part of the founding group didn’t get her recognition as co-founder until 2012, said Amélie. “Jeanne Mance was a nurse, and came here with the other French people and founded the first hospital. She was also in charge of the colony’s finances,” said Amélie. After peddling through several of Montreal’s neighborhoods, Christina and I were hungry. We had a delightful lunch at Le Cartet, a French bistro that also sells gourmet products. Our toasted cheese sandwiches with tomatoes and grilled onions were served on a baguette, and paired perfectly with a glass of crisp white wine. This historic site exceeded my expectations and is perhaps one of my favorite museums. Because it’s more than that. The Pointe-à-Callière Montreal Archaeology and History Complex consists of seven pavilions and structures housing ruins, artifacts, and exhibits. Especially remarkable: Pointe-à-Callière opened to the public in 1992 on the very site marking the founding of Montreal 350 years earlier. Our visit began with a narrated video about the museum and archeological ruins we were about to see. Next, we walked through a series of structures with ruins, artifacts and exhibits showcasing Montreal’s history. Most striking were the remains of Fort Ville-Marie. Interactive displays detail challenges faced by early settlers, and how the site evolved into a small trading center. Before we left – and on a tip from our bike tour guide – we rode the elevator in the reception building to a lookout point (I think on the third floor). From there, we had incredible panoramic views of Old Montreal. A short walk from the waterfront, the Notre-Dame Basilica is located in Place d’Armes. Built in the Gothic Revival style, the beautifully detailed church has stained glass windows, hundreds of wood carvings and religious statues. During the day, long lines wrap around the church. 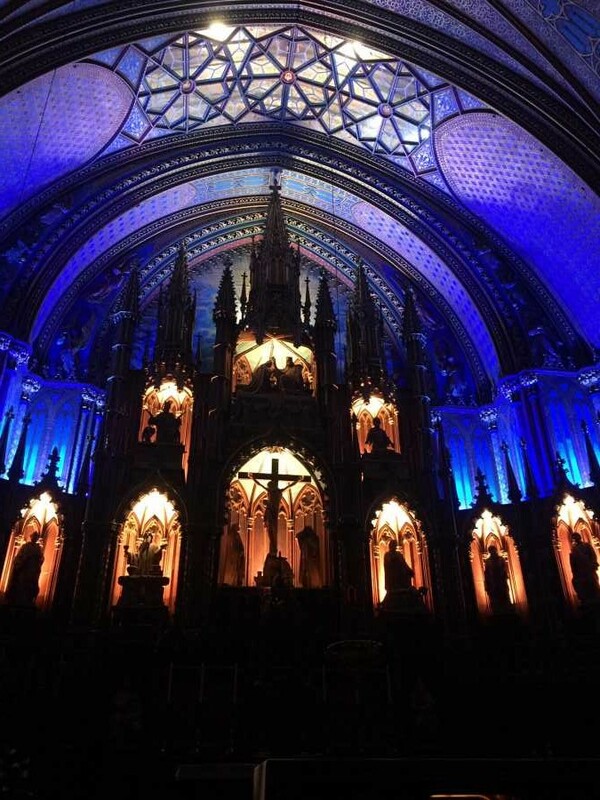 We went at night to see Aura, a popular light and orchestral music multi-media sensory experience showcasing the basilica’s intricate features. After the light show, we walked up to the illuminated installations depicting biblical scenes. Christina and I agreed that Aura was a beautiful and moving way to see the basilica, one of our favorite historic landmarks in Montreal. Though our visit to Montreal was winding down, our trip was far from over. 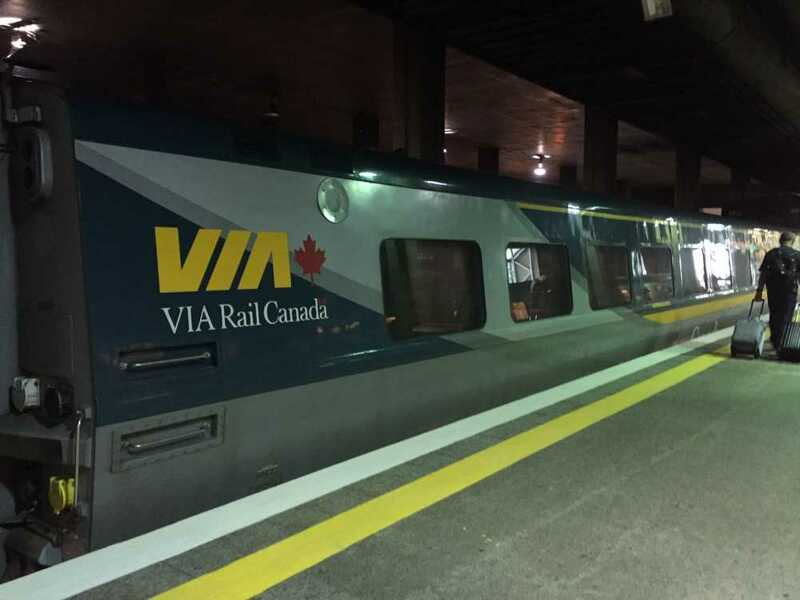 We were excited that in the morning we would take the train to Quebec City. Au revoir Montreal. Bonjour Quebec City.